When Prohibition was repealed in 1933, small, local brewers and distillers were the first to get back into the alcohol business. Many either grew into national brands or were snapped up by larger companies looking to expand. Today, the same scenario is occurring with beer, wine and spirits infused with hempseed oil, cannabidiol or cannabis terpenes. Some big companies are wasting no time, especially with Canada poised to legalize recreational marijuana this summer. 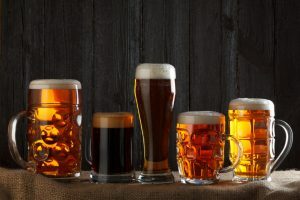 Last October, New York-based Constellation Brands, which distributes more than 80 wine, beer and spirits brands, paid $190 million (245 million Canadian dollars) for a 9.9% stake in Canadian cannabis cultivator Canopy Growth Corp.
Wallin and others believe more large beverage companies will follow. “I’m absolutely certain the Anheuser-Busches, the Bacardis, the Jack Daniel’s are going to get into this, but they will wait until marijuana is fully legal to do it,” said Wallin, who has more than 25 years of experience in the alcoholic beverage business. That translates into business opportunities for hemp growers, CBD producers and companies that extract oils such as cannabis terpenes. Those products don’t carry the same stigma in the United States as THC-laden marijuana, but it won’t be a slam dunk. With whom does “THC-laden marijuana” “carry” a “STIGMA”! Lagunitas (CA)and New Belgium Brewery (CO) , The Hemperor ,both have a hemp- infused beer on the market. Very tasty , pot aroma when you open the bottle. Hemp flavor quite “hoppy”. Drink one and Be Happy!